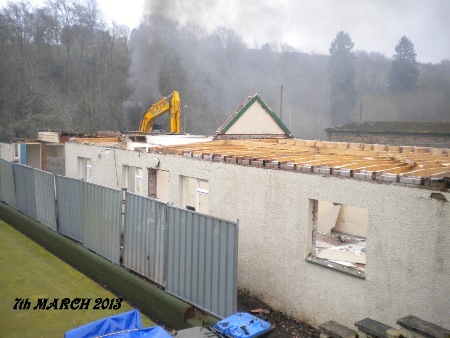 Work got under way in March 2013 build a new clubhouse at Jedburgh Bowling Club after the original 100-year-old building was demolished. The replacement facility was completed by the start of August 2013 a mear 5 months on from the demolition. The project was made possible thanks to a £60,000 investment from sportscotland, £45,000 from the Jedburgh Common Good Fund, £30,000 from BCCF Environmental Group, £5,000 from Roxburgh Sports Council, and £5,000 from Scottish Borders Council’s Community Grant scheme. Now completed, the new facility incorporates separate changing rooms, additional toilets, full kitchen facilities, and a large recreational area. The project is supported by Bowls Scotland and the club will now form part of the governing body’s regional framework. The club already has good links with Scottish Borders Council, but this project will help to further increase participation by strengthening connections with Active Schools and Sport Development teams. “We are delighted to be supporting this thriving local club to build a new clubhouse, which will undoubtedly become a real asset for the whole community. Without the support and assistance from sportscotland, BCCF Environmental Group, Jedburgh Common Good, and Scottish Borders Council this project could not have gone ahead. Hopefully when people see the new facility they will take the opportunity to try out the sport. 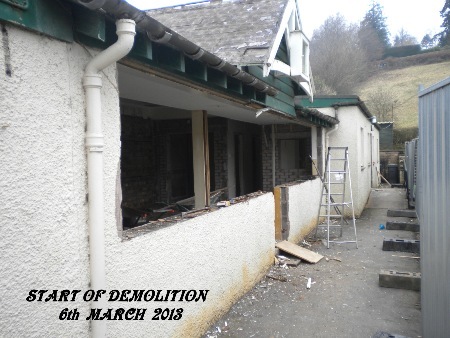 We are adding rugular photo updates as the new Clubhouse takes shape. Once the new facilities are up and running the club hopes to make full use of the facility. During the outdoor bowling season, the club hopes to attract a few representative games to the club such as the Hamilton trophy district tournament and the Matt Purdie Trophy. Off season the club hopes to keep the clubhouse open during the winter months by entering the Jedburgh darts league which takes place on friday evenings as well as putting in some carpet/short matt bowling boards and set up a league. The lounge facility will be available to hire for parties and functions. More information on this will appear on this site once we near opening.